Reading and share top 7 famous quotes and sayings about Living Life For Others by famous authors and people. Browse top 7 famous quotes and sayings about Living Life For Others by most favorite authors. 1. 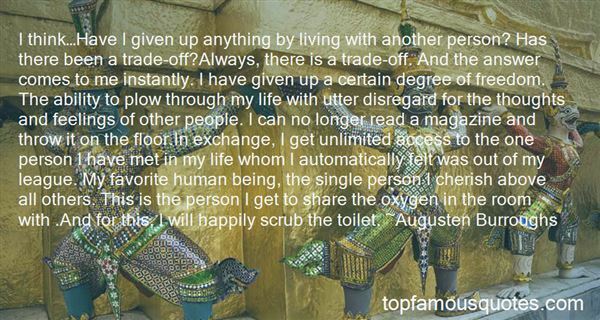 "I think…Have I given up anything by living with another person? Has there been a trade-off?Always, there is a trade-off. And the answer comes to me instantly. I have given up a certain degree of freedom. The ability to plow through my life with utter disregard for the thoughts and feelings of other people. I can no longer read a magazine and throw it on the floor.In exchange, I get unlimited access to the one person I have met in my life whom I automatically felt was out of my league. My favorite human being, the single person I cherish above all others. This is the person I get to share the oxygen in the room with .And for this, I will happily scrub the toilet." 2. "Success to me is: living life well. To be able to live life on my term, Good books and good friends, Often good laugh, To love and be loved, To be able to care and share for others. That's all!!" 3. "?10 SUGGESTIONS FOR LIVING A MORE MEANINGFUL LIFE 1. Be honest with everyone. 2. Change before you have to. 3. Control your own destiny or someone else will. 4. Face reality as it is, not as it was... or as you wish it to be. 5. Instill in others- faith, hope and self-confidence. 6. If you can't develop a competitive attitude or have a competitive advantage, don't try to compete. You'll lose. 7. Don't waste your time always looking for shortcuts. 8. Man-up when necessary. 9. Never lose faith in God. 10. Love." 4. "Imagine living your life without judging others. You can easily forgive others and let go of any judgments that you have. You don't have the need to be right, and you don't need to make anyone else wrong. You respect yourself and everyone else, and they respect you in return." 5. "The people with whom you associate respect you if you live according to the teachings of the church of Jesus Christ. People expect a great deal from the members of this Church because we profess much. I have never at any time found that my membership in the Church and living according to the teachings of the gospel were deterrents.Let each of us every day live an exemplary life, that our influence may be felt for good and that others, seeing our good works, may be led to glorify God. [Ensign, Feb. 1980, 5]"
6. 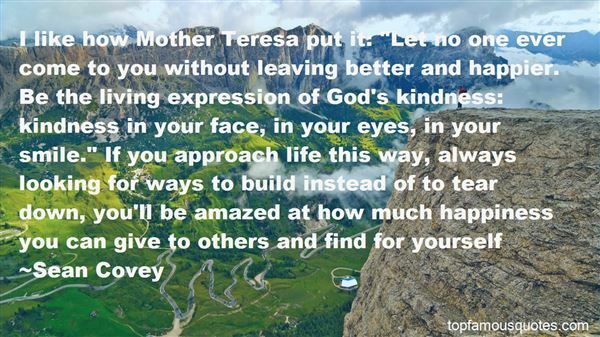 "I like how Mother Teresa put it: "Let no one ever come to you without leaving better and happier. Be the living expression of God's kindness: kindness in your face, in your eyes, in your smile." If you approach life this way, always looking for ways to build instead of to tear down, you'll be amazed at how much happiness you can give to others and find for yourself"
7. 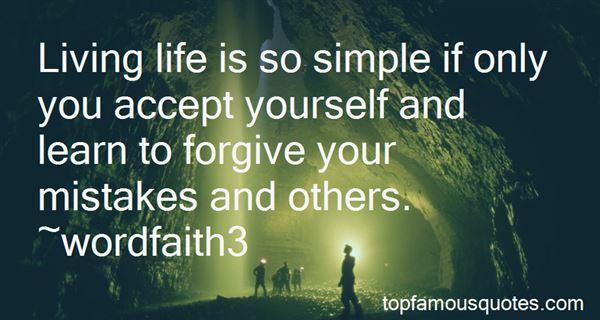 "Living life is so simple if only you accept yourself and learn to forgive your mistakes and others." Christ says, "Give me All. I don't want so much of your time and so much of your money and so much of your work: I want You. I have not come to torment your natural self, but to kill it. No half-measures are any good...Hand over the whole natural self, all the desires which you think innocent as well as the ones you think wicked--the whole outfit. I will give you a new self instead. In fact, I will give you Myself: my own will shall become yours."